Government mandates to serialize pharmaceutical products are increasing around the globe. The California State Board of Pharmacy is requiring that 50% of each manufacturer’s drug products be serialized by January 1, 2015, with the remaining 50% serialized by January 1, 2016. Turkey has required that all drugs be serialized since January 1, 2010. Brazil will require serialization beginning in January 2011. Italy, Belgium, Greece and France all have programs in place. Details vary from region to region, but in general all mandates require marking the smallest unit of sale with lot and expiration information, as well as a serial number, creating a unique license plate for each unit. To facilitate tracking units through the supply chain, units are aggregated into bundles, bundles into cases and cases onto pallets, with the parent child relationships maintained in a database. License plate information for units, bundles, cases and pallets is typically marked on the product in human readable form, as well as being encoded in a 2D code and/or an RFID tag. Although RFID was central to the discussion just a few years ago, it is becoming less prevalent because of the cost of tags and concerns about meeting the pharmaceutical industry’s six sigma quality requirement. 2D codes are becoming the more common choice for encoding units and aggregations. As these concerns with RFID are addressed, the advantages of the non‐line‐of‐sight nature of RFID and the ability to “x‐ray scan” a case to read all units in the case at once, more programs will embrace the error reduction and labor savings that RFID affords. Although pressure sensitive labels, with or without RFID tags, are the most common form of marking for bundles, cases and pallets, laser marking and ink jet coding are more common for units, because of space limitations and throughput speed requirements. 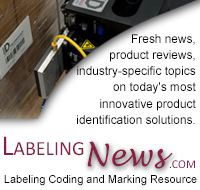 Read the rest of this white paper on labeling & marking for pharmaceutical track & trace.